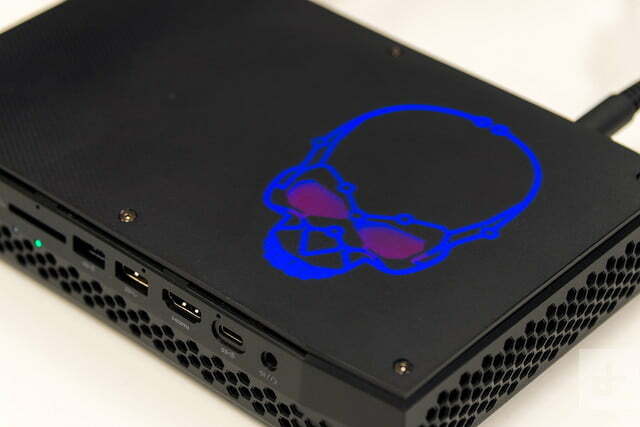 The Hades Canyon NUC is an unparalleled demonstration of pint-sized gaming power. What if your gaming desktop didn’t have to be big and loud? What if it were smaller than a tissue box, and no louder than a laptop? And what if that exact same desktop could handle just about anything else you throw at it, from everyday web browsing to video editing? Those are the questions posed by Intel’s latest Next Unit of Computing (NUC), better known by its ‘Hades Canyon’ codename. The way it answers is a big deal. NUC isn’t a mainstream brand for Intel, but the hardware inside Hades Canyon is important. The processor is Intel’s Core i7-8809G, which pairs an Intel Core processor with AMD’s Radeon RX Vega graphics. It’s an unholy, and consequential, alliance. 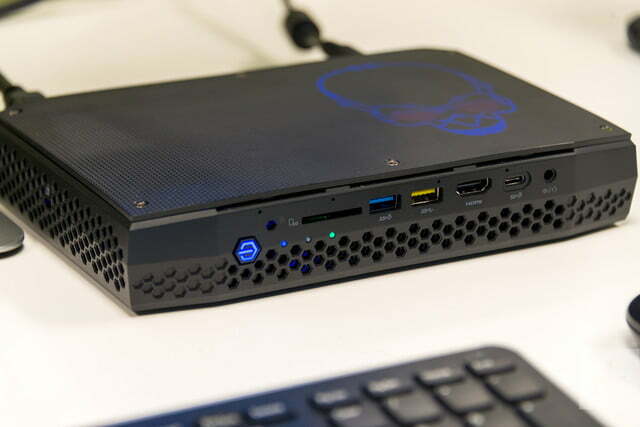 Hades Canyon promises performance equal to a mid-range gaming desktop in a thin box that measures just eight inches wide and less than two inches thick. Is this the dawn of a new era for power-efficient PC gaming, or does the NUC choke on its aspirations? The first Next Unit of Computing, or NUC, was built by Intel six years ago to re-imagine what a basic desktop might look like. Small and boxy, the line has continually pioneered cutting-edge performance in pint-sized machines. If you haven’t heard of it, however, don’t be surprised. The goal of NUC is not to compete with PC builders like Dell and HP. Instead it’s meant to inspire new, thinner, smaller designs, as well as entice business customers who may see value in rolling out hundreds of small, identical computers. Oh, and it can handle up to six displays at once. That’s nuts. 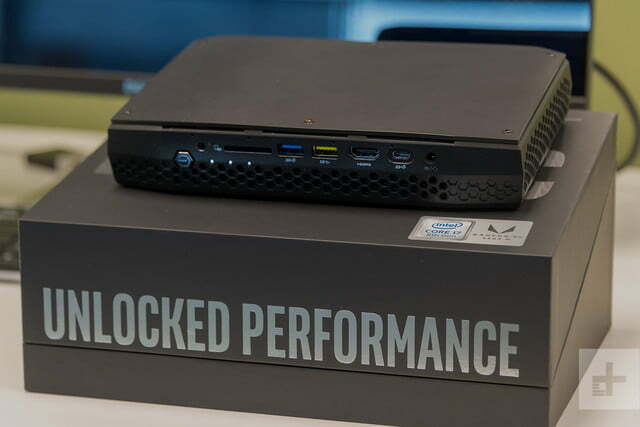 The Hades Canyon NUC, like its predecessors, isn’t meant for the average joe. It doesn’t ship with RAM or a hard drive installed. A Windows license is MIA. You must buy and install all that yourself. The absence of key hardware doesn’t mean a bargain price, either. 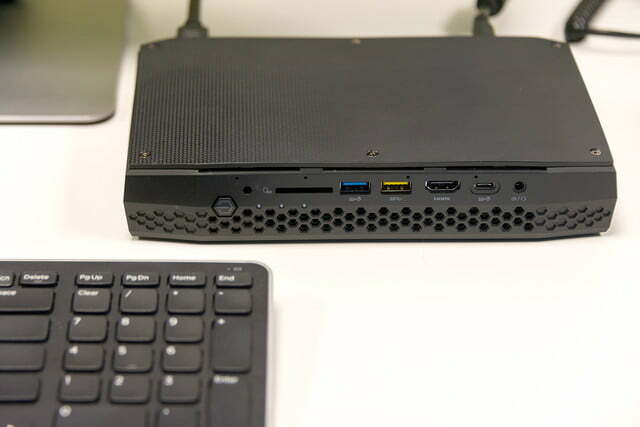 There’s two versions of the Hades Canyon NUC. Our review unit, which is VR-Ready and includes an unlocked GPU, is $1,000. A less powerful version, which has Intel’s locked Core i7-8705G and a less powerful version of AMD’s Radeon RX Vega, is available for $800. The RAM, storage and operating system you must buy will add $300 to $500 to the price of either, depending on what you choose. Though small by most standards, Hades Canyon is the biggest NUC so far. 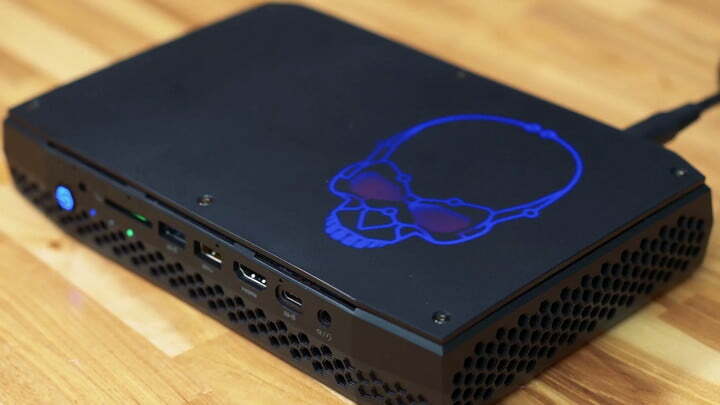 Measuring almost nine inches wide, about five inches deep, and 1.75 inches tall, it’s quite a bit larger than even Skull Canyon, Intel’s first attempt at a gaming NUC. Compared to a full desktop, however, Hades Canyon is diminutive. The Alienware’s Alpha R2 is almost as small at 8 inches on a side and two inches thick, but it’s about 60 percent larger by volume. That’s a difference you’ll notice if you see them side-by-side. The bulk Hades Canyon adds over Skull Canyon goes to the cooling solution, which is much larger than before and now uses a vapor chamber design comparable to that found in Razer’s Blade Pro laptop and the Xbox One X. The internals are equally impressive. The lid, once removed, provides easy access to two DDR4-2400+ slots that can handle up to 32GB of memory. There’s also two M.2 hard drive connectors with support for NVMe, SATA3, and Intel’s Optane memory. 802.11ac Wi-Fi and Bluetooth 4.2 are present, as well. All that’s unimportant, though, compared to Hades Canyon’s key feature. A glowing skull on the lid. It lights up whenever it’s powered on — the skull outlined in blue, while angry eyes shine red. It’s a simple, effective touch that makes the NUC more than another black box. Don’t worry – you can turn the skull off if it annoys you. The Intel Core i7-8809G is a new chip, but the processor itself isn’t the real story. It’s a typical example of high-end mobile hardware from Intel with four cores, eight threads, and a maximum boost clock speed of 4.2GHz. The i7-8809G does benefit from a thermal design power well beyond what most laptops allow, which means it doesn’t have to throttle its performance as often as a laptop chip. That pays dividends in benchmarks. Hades Canyon hit a single-core score of 4,588 in Geekbench 4, and a multi-core score of 16,176. Those numbers beat laptops with 8th-generation Core processors, as well as the Core i3-8100 quad-core in Dell’s XPS 8930 desktop. You’ll see better performance from a god-tier desktop like Origin’s Millennium, which scored 25,857 in the multi-core test, but Hades Canyon does not disappoint. Its performance is on-par with what we expect from desktop computers sold for around $1,000 (though remember the hard drive and RAM you must purchase will up the NUC’s cost). Our video encoding test, which uses Handbrake to transcode a 4K trailer from h.264 to h.265, was also favorable for the NUC. It needed two minutes and 47 minutes to complete the task. Even top-tier laptops, like the Dell XPS 13 and Lenovo ThinkPad X1 Yoga, need four to five minutes. Intel shipped our review unit with an 120GB Optane drive alongside a 512GB solid state drive. That’s a lot of fast storage but, as mentioned, the NUC doesn’t ship with it included. You must buy storage separately. We imagine most owners will purchase more affordable storage, like WD’s Blue 500GB M.2 drive. While the NUC’s processor performance is excellent, the real story is what it’s paired with; AMD Radeon RX Vega graphics. The specific configuration included with the Core i7-8809G is called Radeon RX Vega M GH. It has 24 compute units, a base clock speed of 1,063MHz, and a maximum “dynamic” frequency of 1,190MHz, all pairs with four gigabytes of HBM2 memory. The GPU alone rivals the performance of a PlayStation 4 Pro. The Vega GPU fully supports DirectX 12, Vulkan, and OpenGL 4.5, as well as 4K output at 60Hz. You can, in fact, power up to six displays off Hades Canyon – incredibly impressive for such a small rig. All this is controlled by a reskin of AMD’s Radeon driver software. The color scheme has changed from red to blue and AMD logos have been substituted for Intel, but it’s the same look with most of the same features, including Wattman for overclocking, Chill for quieter use in less demanding scenarios, and FreeSync. The use of AMD drivers is reassuring because driver support has been a major problem for Intel graphics in the past. We’re skeptical about future updates, however, because Intel hasn’t committed to a schedule. It’ll be a disappointment if the drivers are updated once every few months or even less. What the future holds we can’t say, but we can tell you how Hades Canyon performs right now – and it’s impressive. Hades Canyon enters the 3DMark test strong, scoring 8,469 in the Fire Strike test. That’s almost exactly what we saw from Dell’s Inspiron 15 7577 Gaming, which we tested with Nvidia’s GTX 1060 Max-Q graphics. It’s just slightly behind the HP Omen 15 which, again, had the GTX 1060 Max-Q. 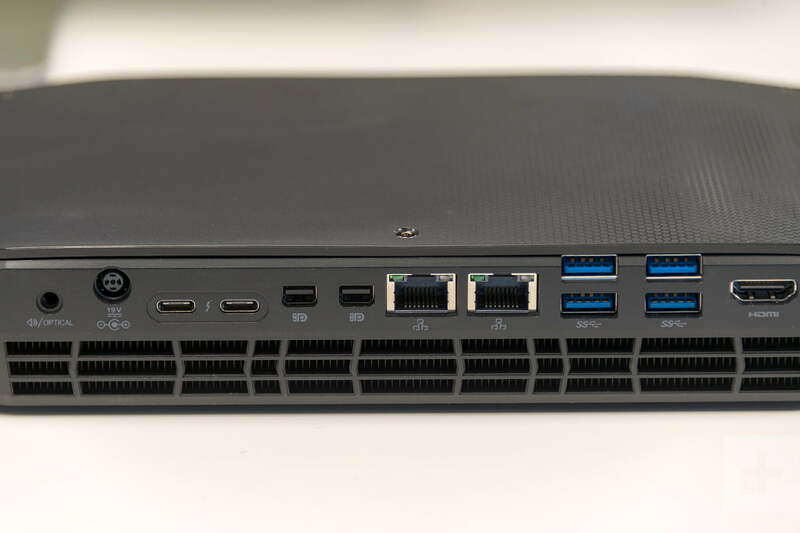 The Dell XPS 8930, a tower desktop with a standard GTX 1060 card, scored notably better at 9,767, but Hades Canyon is still in the same ballpark. And the NUC easily beats the Acer Nitro 5 Spin, which scored 5,209 when equipped with a GTX 1050 Ti. We saw similar results in games. Rocket League and Civilization VI were handled with ease; even the latter averaged 47 frames per second at 1440p and Ultra detail settings. Battlefield 1 averaged better than 60 FPS at 1080p resolution and Ultra detail. The game managed an average of 49 FPS at 1440p resolution and Ultra detail. Deus Ex: Mankind Divided was, as usual, the real challenge. Still, the game averaged 33 frames per second at 1080p resolution and Ultra detail. It also averaged 31.7 FPS at 1440p and High detail. The game is entirely enjoyable – if you give up on the dream of 60 FPS gameplay or anything close to it. Benchmarks aside, we wanted to see what it was like in the real world – so we used it for a long weekend of gaming. Hades Canyon proved a capable gaming companion. This isn’t just because its powerful, though the benchmarks do show it’s a quick machine. The NUC also benefits from today’s more forgiving mainstream games. Want to play The Witcher 3 or Final Fantasy XV with everything turned up? This isn’t the machine for you. That’s not what we usually do, though – we more often find ourselves playing Overwatch, Fortnite, or Rocket League. Games like those run without trouble on Hades Canyon. You can play jaw-dropping titles at high or even maximum detail, however, if you settle for 1080p resolution and 30 to 45 frames per second. For that reason – and because you can’t upgrade the GPU in the future — we think Hades Canyon is best when paired with a high-refresh 1080p monitor. 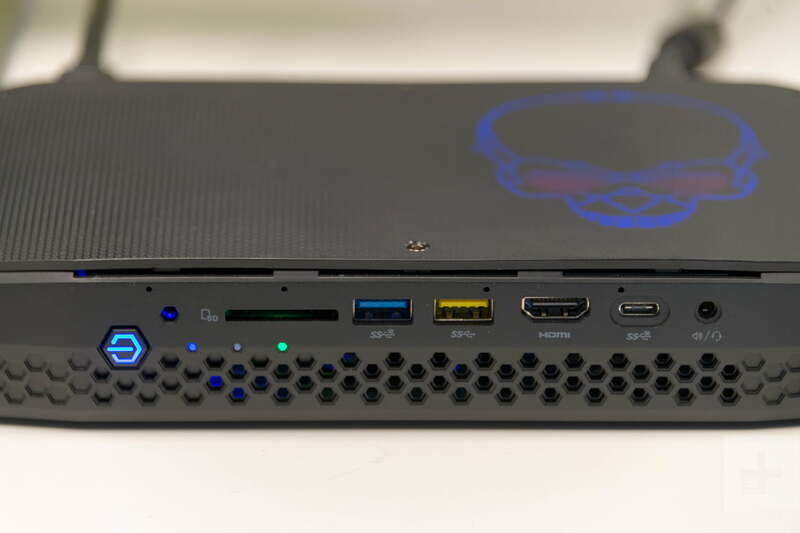 Gaming is enough ambition for a PC as small as Hades Canyon, but Intel hasn’t stopped there. The company also says it can handle virtual reality. In fact, that seems half the reason for its incredible buffet of connectivity. VR headsets demand plenty of USB and video connections. Enjoying VR on a system this small may seem crazy, but there’s logic to it. It’s quite difficult and annoying to hook up a headset to a large desktop. That goes double if the headset is ever moved between computers – as is common, because having a VR headset connected 24-7 can be annoying. Better still, a small PC opens the possibility of pairing it with a battery pack and enjoying tether-free VR. 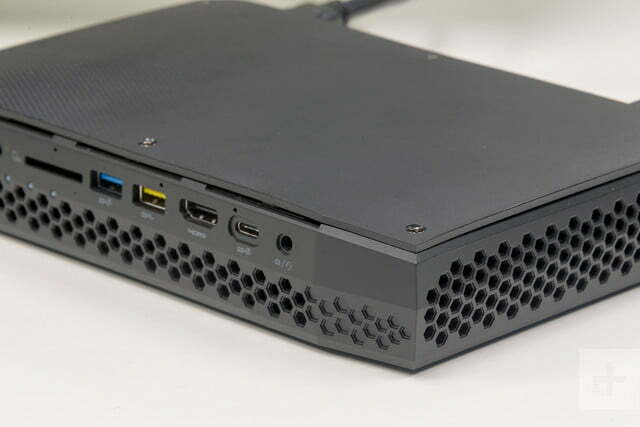 The NUC’s power is cutting the minimum requirements for VR close, however. VRMark’s easiest test, Orange, reached a score of 2,583. The benchmark’s notes said that score was insufficient to promise a smooth VR experience, since framerates often dipped below 60 frames per second, nevermind the 90 FPS that’s preferable. Our limited experience showed success will depend entirely on what you try to do. Star Trek: Bridge Crew was no problem on the Vive, but you’re not going to be able to use the Vive Pro smoothly. In the end, the VR verdict is a lot like the system’s gaming performance – it’s more than enough for many titles, but it’s not going to handle cutting-edge VR experiences with all the settings turned up. 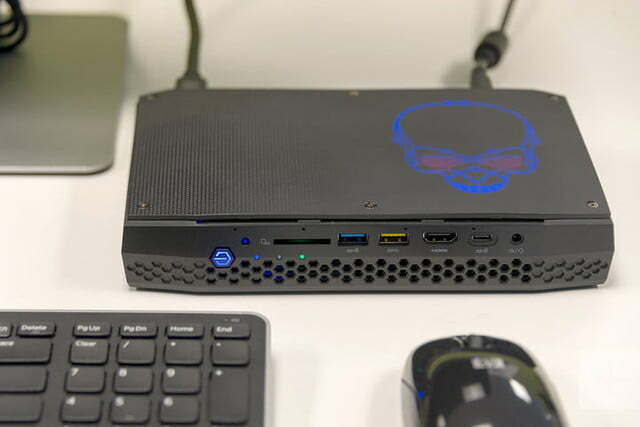 Intel’s Hades Canyon NUC is early, definitive proof that the company’s partnership with AMD will be fruitful. We’re amazed to see a system so small handle all the titles in our test suite at 1080p and maximum detail. Pricing, and the NUC’s niche audience, are its only obstacles. $1,000 is a lot to ask for a PC lacking a hard drive, RAM, or operating system, no matter how impressive its other hardware. The Alienware Alpha R2 was the gold standard in this segment, but a lack of updated hardware means it still offers only a sixth-generation Intel Core processor and Nvidia GeForce GTX 960 graphics. Other options include the MSI Trident 3 and Zotac’s Magnus line – but again, these systems are a generation or two behind the Hades Canyon NUC. The competitors are less expensive, but none offer as much performance per cubic inch. Intel ships Hades Canyon with a three-year warranty. That’s unusual for a desktop. We think it’ll struggle to remain relevant to gaming for longer than its warranty, as more demanding games will certainly push beyond the system’s limits. Yes, if you’re a hardware geek. Hades Canyon fills a wonderful niche. If you’re willing to slap in a hard drive and RAM yourself, this NUC will prove an outstanding compact gaming PC. If that’s not you, don’t worry. We’re sure the Core i7-8809G will appear in rigs built by major brands later this year.